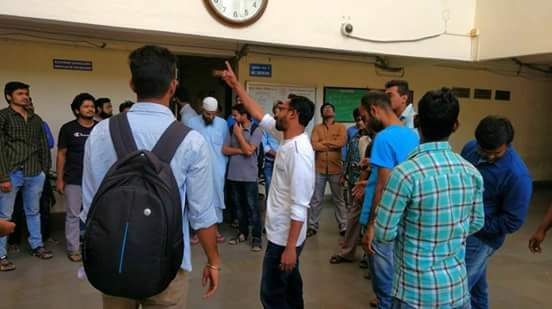 Students of Hyderabad Central University voiced against its administration over the discriminatory approach towards students from marginalised sections. 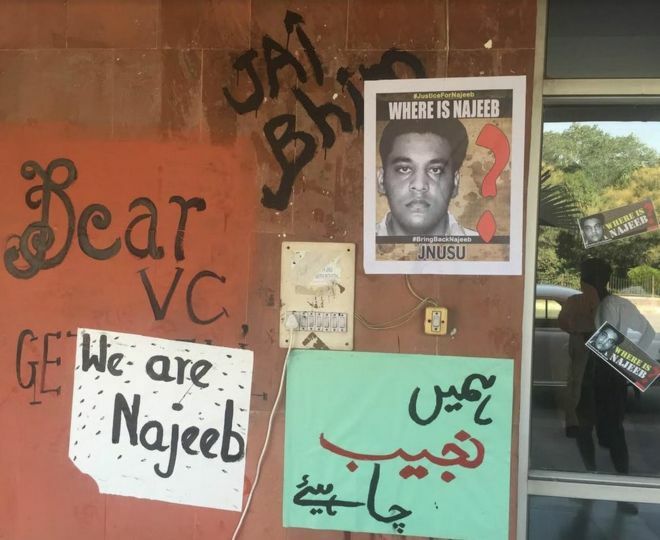 The students alleged that the security officials made Islamophobic statements when a Muslim student sought to meet her friend from Maulana Asad National University. “The main gate once again comes into play here where the segregation happens by keeping the “others” (activists, academicians etc) outside the campus for “security reasons”. This adds to the existing trend of discriminatory practices inside the campus where marginalised communities (students, teachers and non teaching staff) are humiliated on daily basis inside close quarters of this “elite institution”.” A student of HCU, Shiva Sai Ram wrote in facebook. Hundreds of students joined the protest soon after the call was given. The protesters entered into the administrative building and continued there for around four hours. 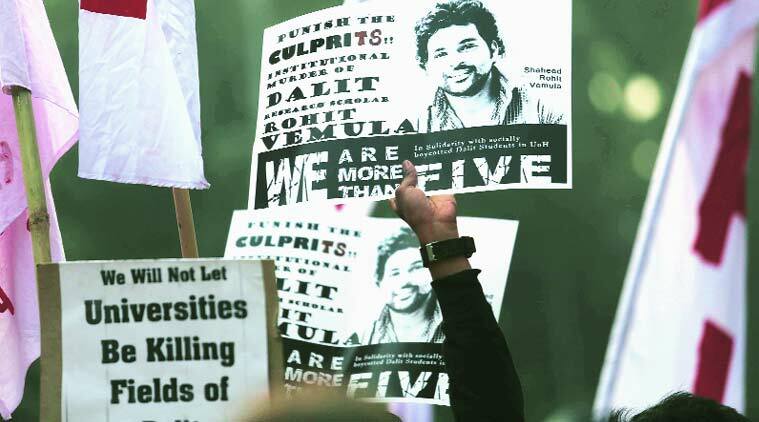 Students said that this is not the first time such condemnable and atrocious act is taking place in the campus. The protest was concluded after receiving administration’s written statement that a committee will be formed to investigate the issue and appropriate action will be taken on the basis of the report in one week. “In the initial three and half hours, since we started our protest, nobody from the university administration came to meet us. At last they were forced to sent Deputy Registrar in charge to have a talk with the protesting students. The administration is so ignorant to the issue. There was no initiative to address the issues of the Muslim and minority students in the campus. No they have given a written assurance to us that they will form a committee to investigate the incident and take action based on the report in one week time. If justice is not delivered in one week, there will be more intensified struggles. 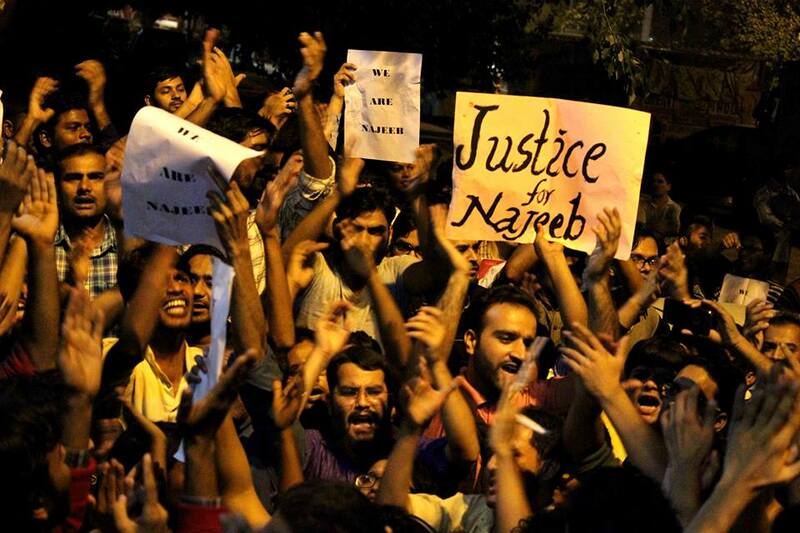 We are not going to sit quite.” Said Kuldeep Singh Nagi, Students Union president of Hyderabad Central University. Anand Patwardhan and Meena Kandasamy urged to cast the vote for ASA in HCU Students Union Election. 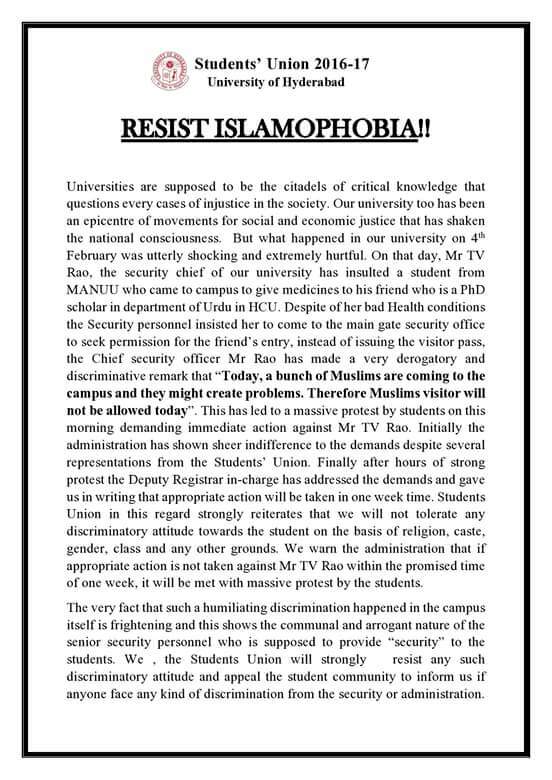 Be the first to comment on "Anti-Muslim statement by security official; Students Protest in UoH"